Why make compost? For one thing, its cheap. You can make your own compost from your garden and kitchen, recycling the nutrients back into the soil. Second, it's great for your soil. Adding compost increases soil aeration, water holding capacity, soil structure and texture. Amending your soil with compost rather than synthetic fertilizers can save you a bundle as well. As soon as we moved out to the farm last November we started our own compost piles. 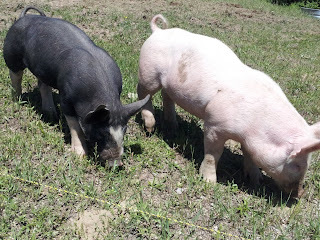 While we had to wait impatiently until the spring to start growing our own food and getting most our livestock, we were at least able to start composting. We have 3 compost piles that we framed with pallets. Now we're letting them sit and mature and starting 3 more piles! You can compost all your kitchen scraps (save dairy and meat), cardboard, non-glossy paper, hair, dryer lint, grass clippings, pine needles, weeds and fallen leaves from the garden. Doing so cuts your garbage output by easily 1/3! Check out what all you can compost at this helpful site, and what to avoid as well. Make sure to shred or tear up the paper and cardboard and compost into smaller pieces so it composts more quickly. You don't need a fancy bin to compost, there are plenty of cheap and easy ideas out there, from recycling pallets, to using chicken wire or a 55 gallon plastic barrel. Now for the how-to. Making compost is all about gathering the materials in the right ratio (called the C:N ratio, or Carbon: Nitrogen ratio), then providing the aeration and moisture needed to let these decompose. The preferred ratio for composting is 25 or 30 to 1. This means you need farm more Carbon-rich materials in your compost pile than nitrogen. Here's a handy dandy C:N chart that breaks down common ingredients. Carbon-rich ingredients are often called the "browns," and include items like leaves, wood chips, pine needles, and cardboard. This will make up the bulk of your pile. The Nitrogen-rich ingredients are often called the "greens," these are your kitchen waste, garden waste and grass clippings. Now to aerate and moisten you pile, we recommend flipping every 1-2 weeks with a large garden fork, spraying down the pile as you do so if it needs to be moistened. Your pile should be as wet as a wrung out sponge. The more often you flip your pile, the faster it will mature, but you can leave it unflipped and do passive composting, but you won't get a finished product for 1-2 years. By flipping, moistening, and managing you pile, you can get compost in 4-8 months! Still Don't Think You Can Compost? Having lived in the city, in apartments and houses with landlords who shudder away from the phrase "compost pile," we understand that not everyone has the space to start their own compost pile. We weren't able to for years because of where we lived. Every meal I'd find myself looking sadly at scraps of vegetables and wishing for some way to make some thing useful and productive out these inedible bits, a compost pile or a pig or something! Which is why we are opening up our compost piles to your trash! Want to compost but don't have the space/ability? Buy two 5 gallon buckets and collect your scraps and compostables every week, you can drop off your 5 gallon bucket with us at the Farmer's Market, at your share pick up, or drop it off with us at The Shire Farm. Use your second 5 gallon bucket the next week and we'll swap you! Yes, you can vicariously compost through The Shire Farm, and feel assured that your waste and scraps are being put to good use, fertilizing and improving the soil for your vegetables! Good morning Veggie-vores! We finally got some rain this morning and a break from the heat! 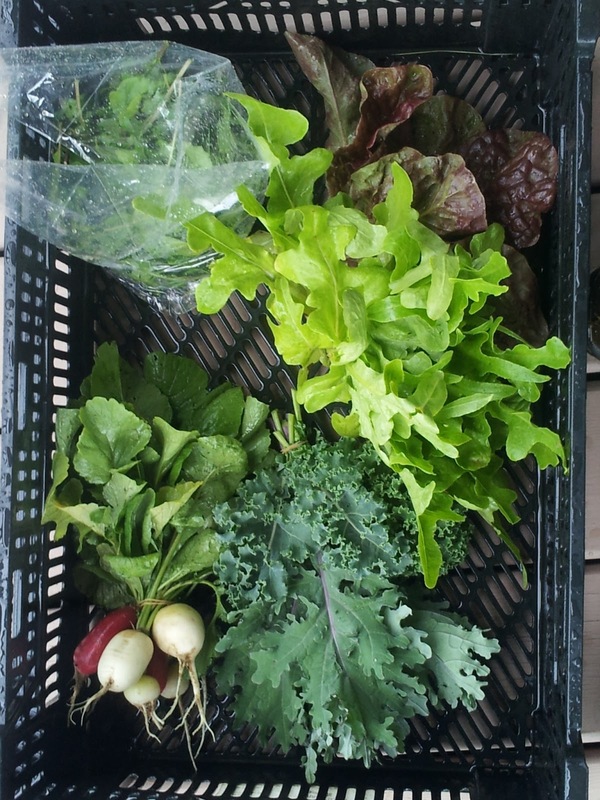 This week we have a bag of Arugula and Spinach, Head lettuce, a bunch of Kale, and a bunch of Radishes. The plants are drinking up the rain greedily, but the heat and lack of rainfall (and rabbit's munching on them) has slowed our peas down this week. We're giving them to week off to recover and grow, hopefully we'll see more next week! 2 heads of lettuce, and a bag of Arugula and Spinach! The heat has plumped up these radishes! This week we have 2 varieties for you, the white Ping Pong radish and the longer red French Breakfast variety. We really like the French Breakfast, its a little sweeter and milder in taste, great for getting your kids to try out radishes. Our favorite snack is lightly toasted bread with butter and sliced radishes, give it a try! This week we have a mix bunch of Kale including the Winterbor (curly) variety and the Siberian Kale (with the purple veins). Juice them, sauté them, or make them in to chips! 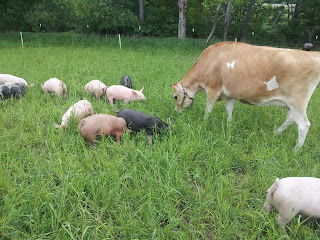 Summer is Here on the Farm! It's getting hot and humid out here on the farm. We've officially hit the first day of summer and the summer solstice and we can feel it! It's been in the high 80s and huuumid, yet rainless the past week or so. Both Farmer Figgins and Farmer Fahler are a bit on the sunburned and crispy side, but we're hoping for rain the next few days. 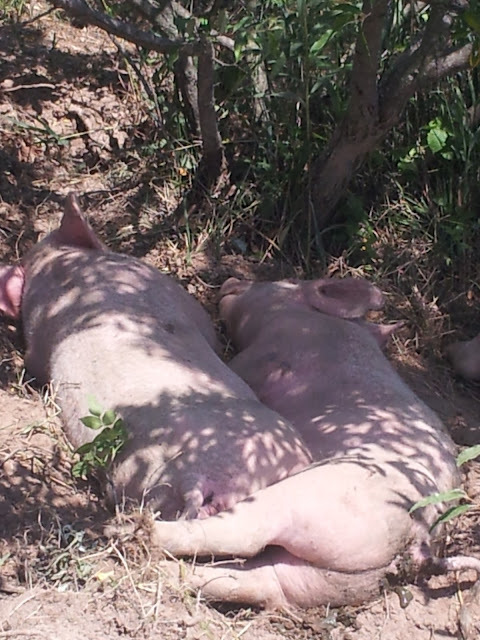 The pigs taking a nap on a hot summers day, avoiding sunburns of their own. We finished the last of our third, and final until fall, planting last Friday. Which consisted of an extra pumpkin patch ringed with sunflowers. 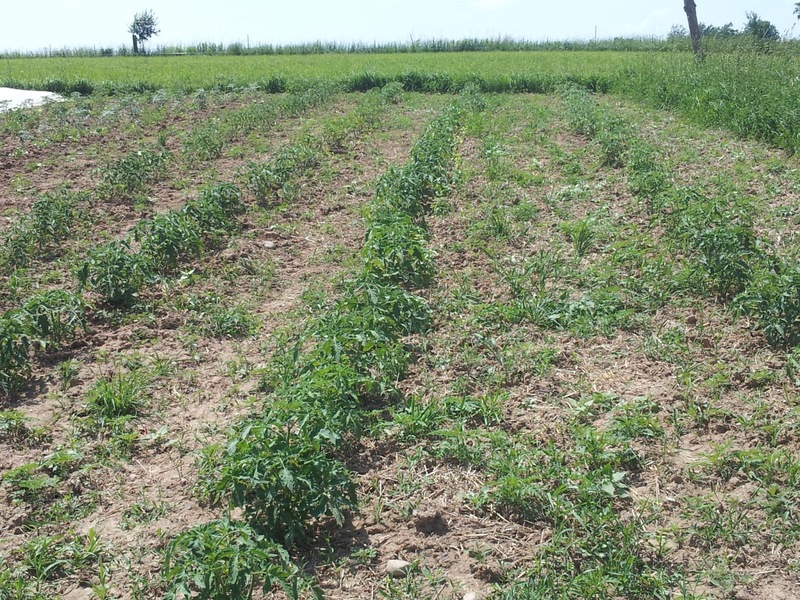 Now its time for weeding and more weeding, and then some harvesting in store for these farmers. One of the biggest challenges of farming without chemical aides is the battle with weeds until our crops are tall enough and strong enough to shade out and out-compete the weeds. Tomato patch needs some weeding...like many other things. The heat is stressing out some of our cool-season crops, causing crops like the arugula, spinach, and radishes to bolt, but others are loving the heat. 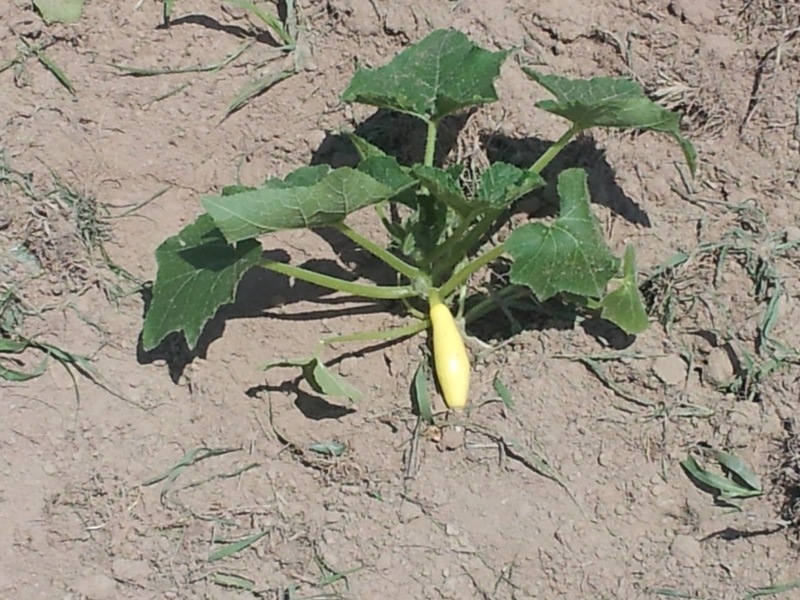 Many of the pumpkins, tomatoes, summer squash and melons have started flowering! 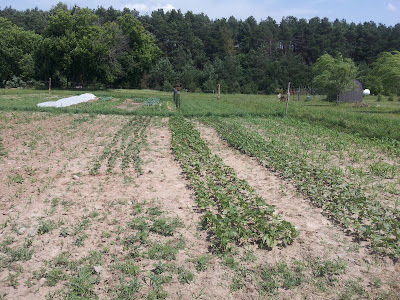 The Kohlrabi, Cucumbers, Broccoli, Cabbage and Onion and leek crops are all coming along well. Starting to see flowers on our tomatoes! The first summer squash of the season! Looks like a yellow crookneck! It looks like we've had pretty good germination overall, the only crop that had some problems was the first planting of our dry beans. Many failed to germinate, and I found more than a few seedlings rotting in the soil, or Damping Off. They were planted right before a rainy, wet week, followed by hot temperatures. Luckily, we didn't plant all our beans at once, and the second planting of dry beans had excellent germination. This is exactly why we do multiple plantings, so that not all our eggs are in one basket and we can spread out the risk inherent in farming. The second dry bea bean planting is coming up real well! 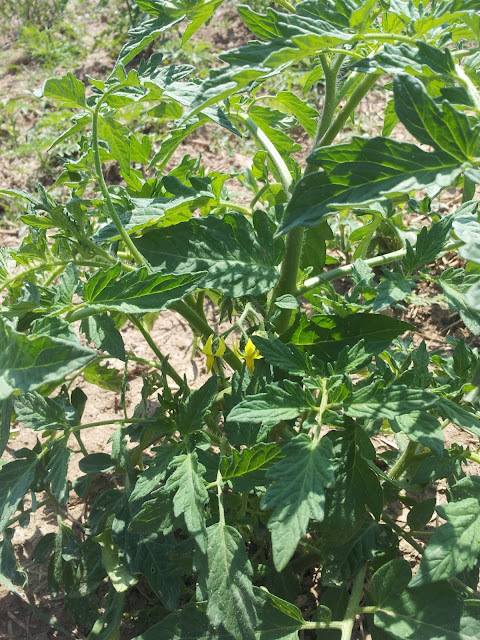 We've been finding new residents on the farm, including flea beetles in the tomatoes and eggplant, bean beetles on the beans, turnip maggots in our turnips, and most recently Colorado potato beetles on the potatoes. As we've said before, we don't use synthetic chemicals on our crops, but try to use natural, organic pesticides or IPM. For the flea beetles and bean beetles I've been using a natural spray I picked up from another gardener's blog. 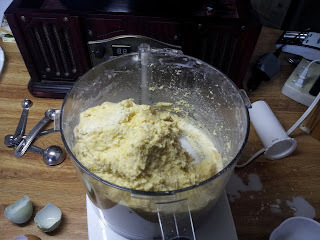 Pureed onions, cayenne peppers, and garlic and let this sit in water for 24 hours, strain this through a cheese cloth. 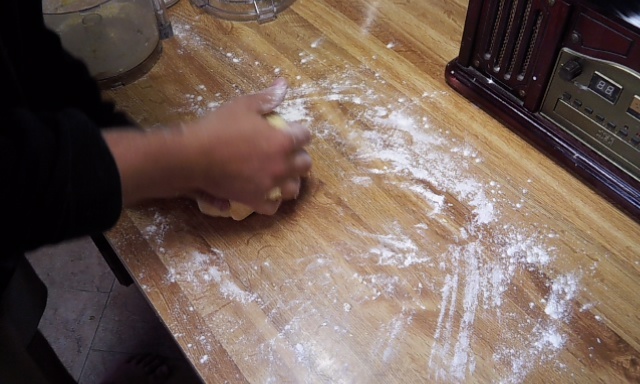 Put the strained mixture in a gallon jug/sprayer and add enough water to fill. I've been spraying this once a week in the mornings on the tomatoes and beans and we've seen a significant drop in damage from flea beetles and bean beetles. The mixture simply makes the leaves unpalatable for the bugs and they move on. Luckily, we're not eating the leaves! Unfortunately, organic controls like this don't exist so much for Colorado potato beetles and the turnip maggots. 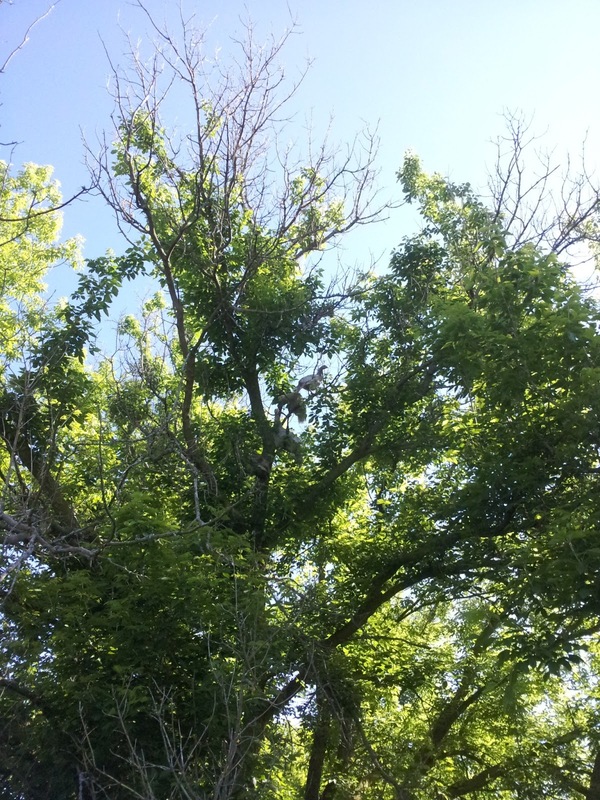 For the maggots, you have to rotate your crops away from the infested area, and for the potato beetles we have to had pick and kill all the beetles and eggs we see. The animals on the farm are finding ways to cope with the heat as well. 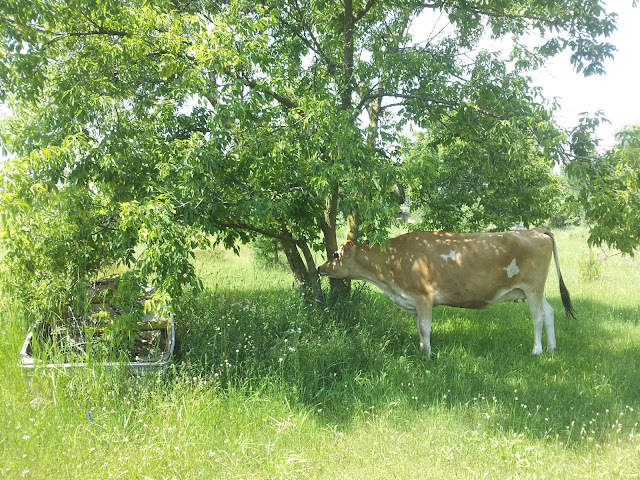 We moved Rosie's pasture today to give her some fresh grass, her new pasture has three large shade trees that she's loved scratching up against and taking naps under. We moved Rosie's pasture today, she's loving all the big shade trees! 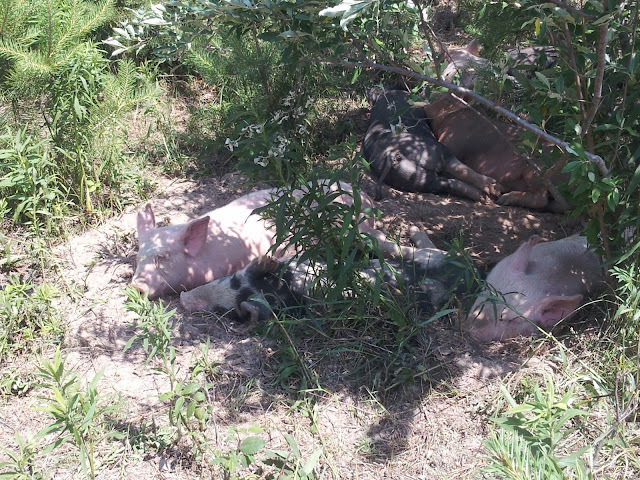 The pigs take long siestas during the heat of the day, napping under small trees in a big pig pile. 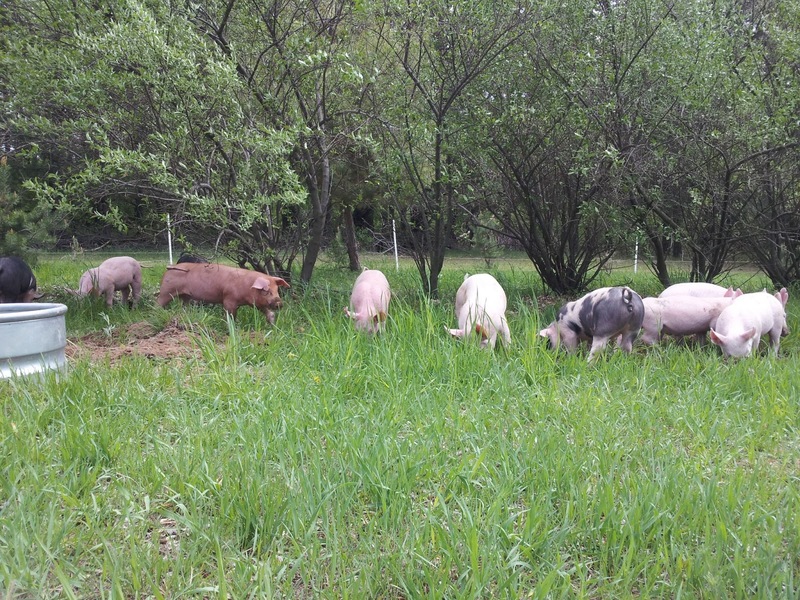 They forage and root in the cooler parts of the day, in the morning and evening. When they need a cool down, they go to their wallow area, which we refresh with the water from their trough every time we empty and refill it. They also enjoy a late afternoon shower from the hose, and will snort and dance around in the cool spray. 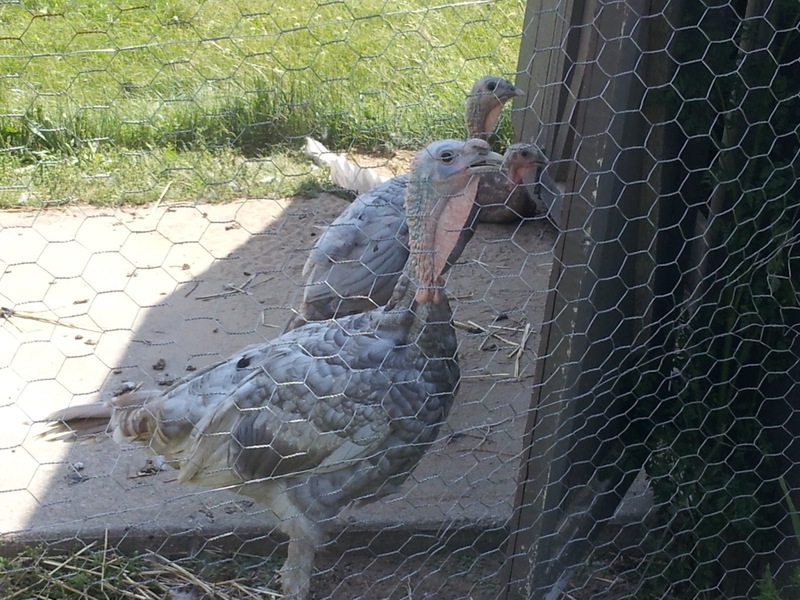 The turkeys have figured out how to get out of their enclosure, which we knew was inevitable. Sometimes they'll hang out on the porch of the house, but they particularly like roosting in a large shade tree in the center of the farm. When they wander into the garden, they mostly nip at weeds and bugs. Though whenever they enter onion, peas, and corn sections we have to shoo them out, they like the taste of those too much! See if you can spot them! They're getting big! Here's Tom, the oldest of the bunch. 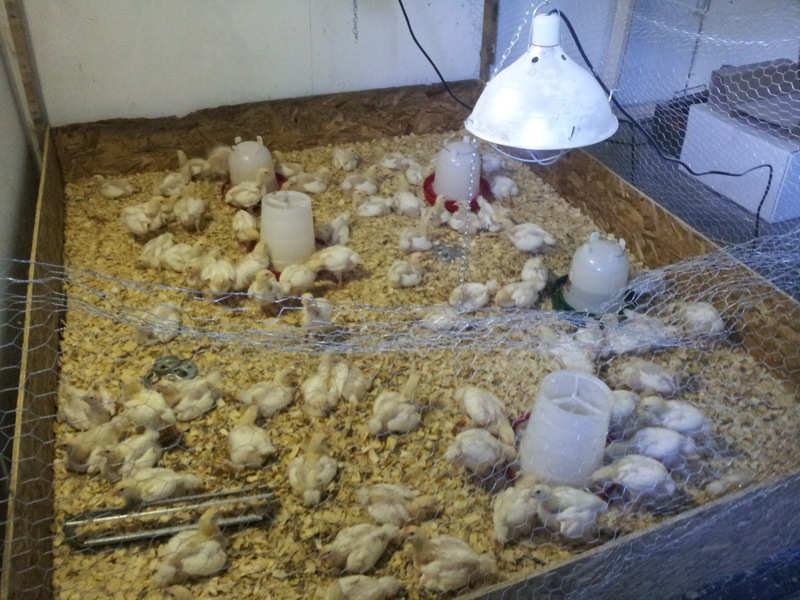 We also processed our first batch of meat-chickens this week, and we've got a full freezer! The first batch was for our own chicken supply, and to do a run-through and work out any kinks before we moved onto a larger batch of chickens. 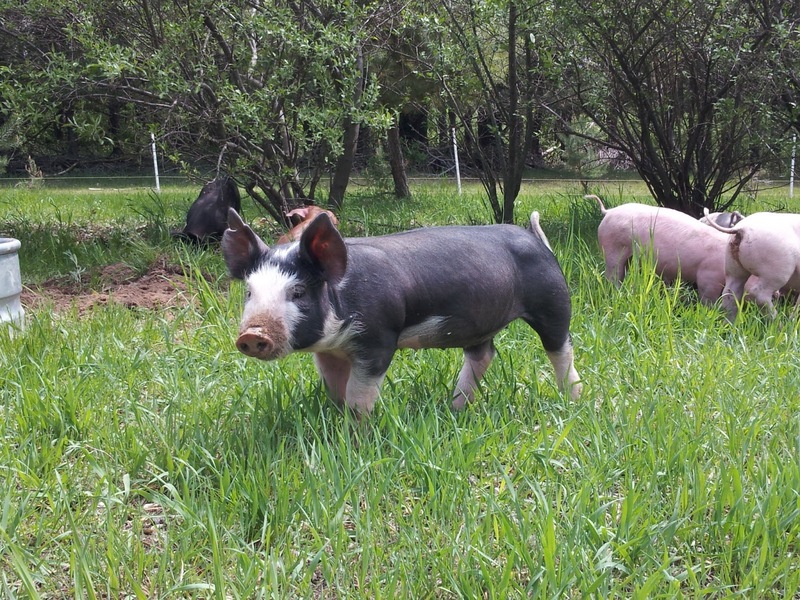 Our newest batch is doing great, we'll be moving them out to pasture soon! If you're interested in our pasture-raised chicken, check out our Pasture-Raised Chicken page and send in a deposit of $5.00 per bird. They pick up will be at the end of July/early August on the farm, as whole roast chickens, 4-5 lbs. we'll be moving them out to pasture in a week or so. Hello Veggievores. 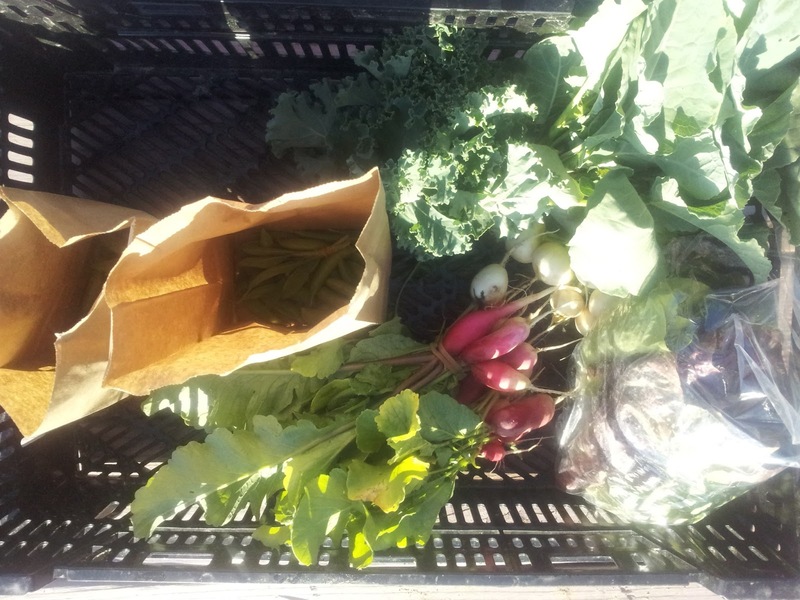 This week in your share we've got Radishes, Japanese Turnips, Lettuce heads, the first Sugar Snap Peas of the season, Kale and Broccoli braising mix, and Sage! We have a variety of young lettuce heads for you this week. You may have any one of a few varieties including, a Parisian Red lettuce, Oakleaf Lettuce, or Iceberg. Make a salad, it doesn't get any easier and will be a great starting point to use the rest of the share! 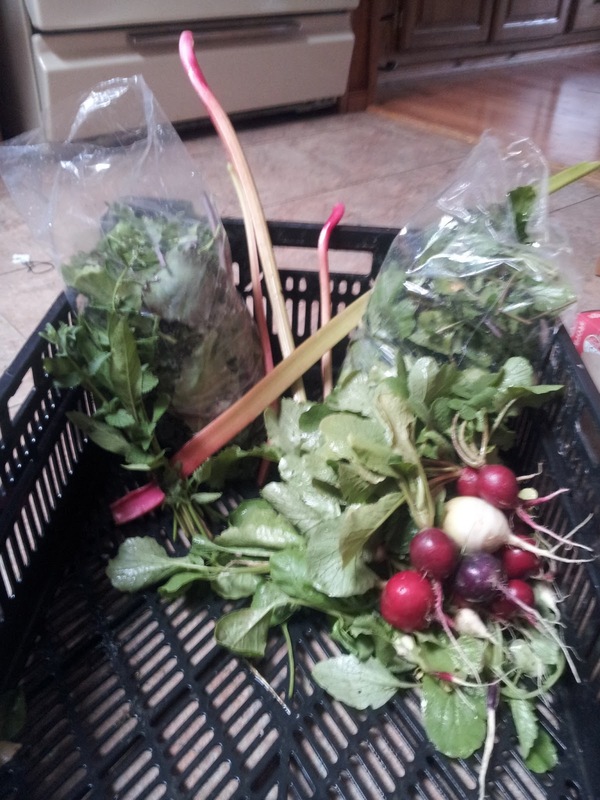 We have another bunch of Radishes this week, which can be eaten raw on salads, sauteed, grilled, or roasted as a side! While there are less greens this share, you can still steam, saute, or make Radish Leaf and Potato Soup. What did you all make with your Radish greens last week? This week we have a bunch of Broccoli and Kale greens. Perfect for sautéing, steaming, stir-fry or braising. Or you can make chips out of the Kale and Broccoli leaves! Or, you can give our Kale and Tomato Frittata recipe a try. You can also stuff those Broccoli leaves with all sorts of goodies! The first of the season's sugar snap peas! (hidden in the paper bags) While there's not much in this week's share, not all of the peas are flowering and bearing pods yet, there should be plenty more in the future. We love to eat these raw as a snack, if you can stop yourself from doing this and want to make something with them try these recipes! Unfortunately, our Radish and Turnip patches seem to be infested with Turnip Maggots. These little buggers burrow into the root, and there's little organic options for control besides crop rotation. Luckily, we recently seeded a second batch of turnips in a different part of the field, so we we'll be seeing turnips again! We've harvested all that were ready and gleaned through them for the best of the bunch. As a result we only have a few turnips to try. Try these turnips roasted, grilled on raw on a salad. 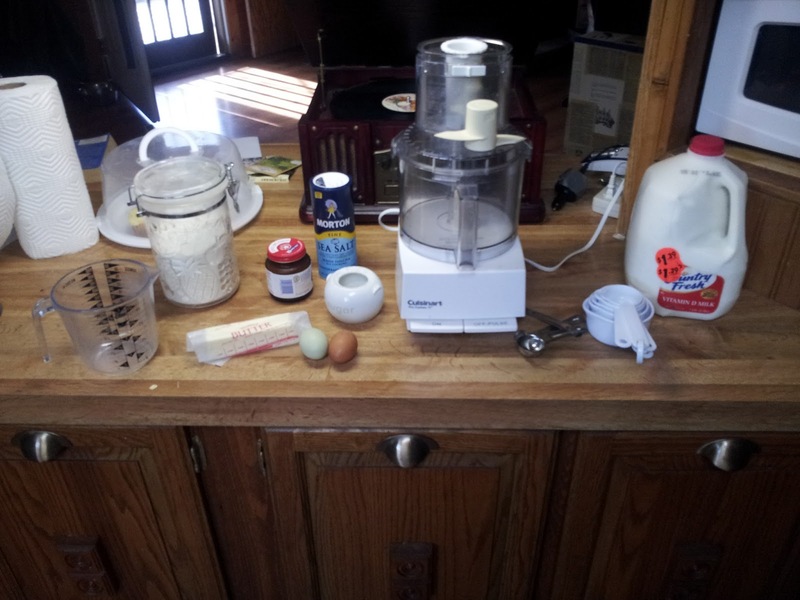 Here are a few recipes to guide you! We've also included more Sage this week. 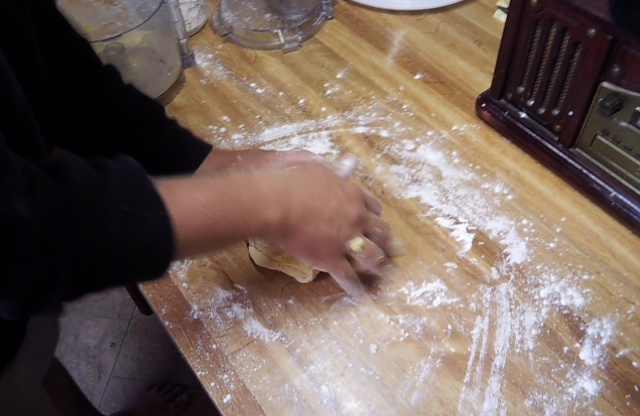 Sage goes well with many meat dishes--lamb, beef, poultry. We like to use it for roast chicken, or substitute it for the parsley and in our Whole Wheat Italian Herb pizza crusts. Check out this Spice chart to see what spices go well with what dishes. 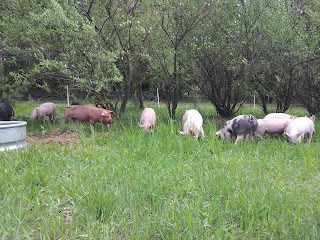 The piggies have been with us for a month so far and we're really enjoying them! 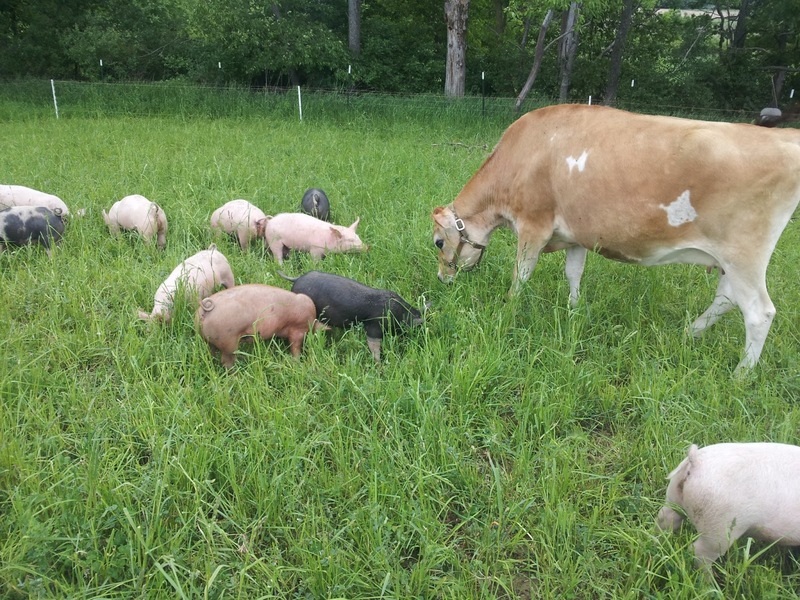 They're loving being out on pasture, rooting up the grass and weeds and wallowing in the mud and playing with Rosie, our cow. 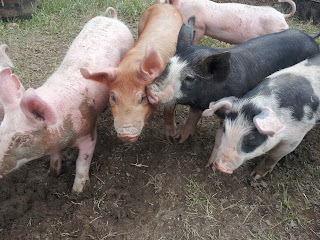 Some of you have been out to visit the farm and gotten to meet the piggies, for those of you that haven't, here's the gang! We named out pigs after Game of Thrones characters because a) there are a lot of characters b) there are a lot of female characters and we have a lot of females and c) the series is known for killing off every character you ever love, so its kind of fitting. Arya, a Duroc/Berkshire cross who is in the running to be kept next year as a sow. Shea (left, a Berkshire) and Brienne (our largest female Yorkshire/Berkshire cross). 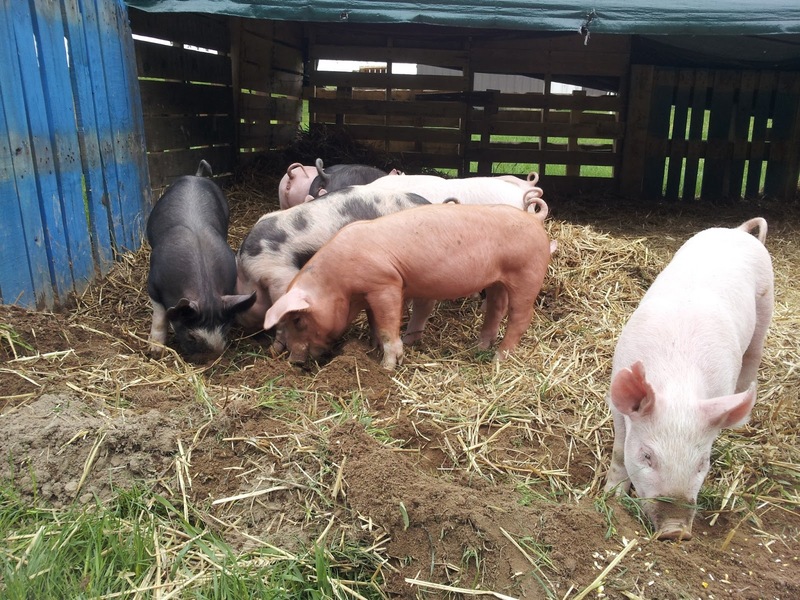 We keep our pigs enclosed with electric polywire (the yellow wire), step in posts, and a mobile solar energizer. Hodor! Our biggest and friendliest male pig. Whenever we go out to the pigs he's the first to approach. He'll stand next to you and wait for scratches and even roll over for you to get his stomach! 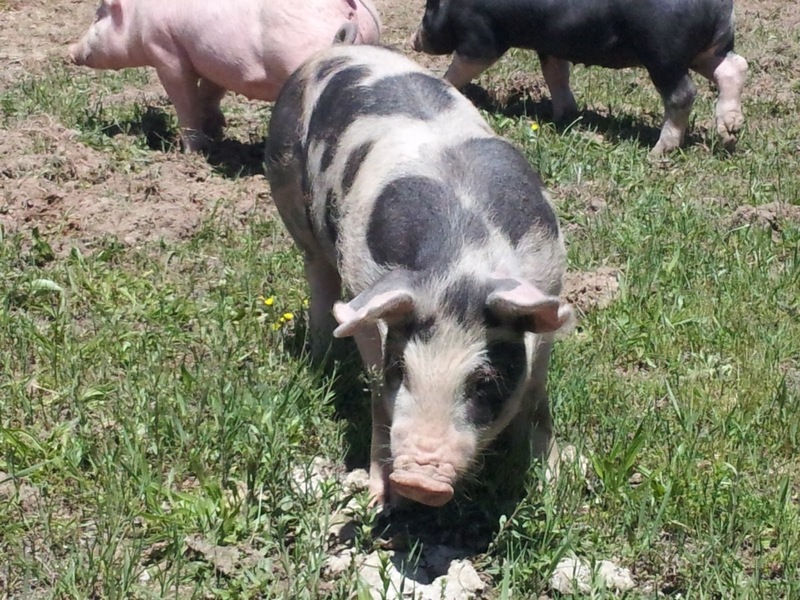 Our other male pig, Drogo rooting around. Margaery, our other Berkshire female who is full of piss and vinegar. 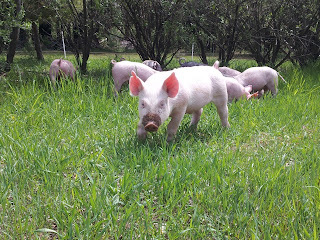 She's always the first in the feed trough and the most playful and rambunctious of the bunch. Sansa (the red Duroc/Berkshire cross) is one of our more timid and mellow pigs, and also in the running to be kept next year as a sow. In the background is the piggies temporary summer shelter, made out of pallets. We have 4 Yorkshire/Berkshire Females: Brienne, Asha, Cersei and Daenerys. The Yorkshire/Berkshire cross are all very friendly and fast growers, but sometimes a little too friendly, nipping on our shoes and legs until we give them attention and scratches! Look at those happy pigs! I wanted to take a brief moment to say thanks and ask for more at the same time. We have nearly filled our CSA in the first year! For that we owe a great thanks to the local community willing to take a risk and support a local and new farm. Here on the website we are over 5,000 views, and have gotten well over a 1,000 views a month now. THANK YOU ALL!!!!! The reason it is so hard to get good food is the slim margin that small farms must survive by, the smallest hiccup can really mean a lot of heartache and closed doors. Large agriculture is protected from these losses by tax dollars that go to subsidies in the amounts of millions of dollars. These subsidies are not available to small farms such as ours, in fact we could not even qualify for special farm loans, and would be laughed out of the bank, and USDA offices (and have been). That is why the commitment of our share holders is so important. They provide a much needed level of stability, making the same commitment as us, the farmers, have made. 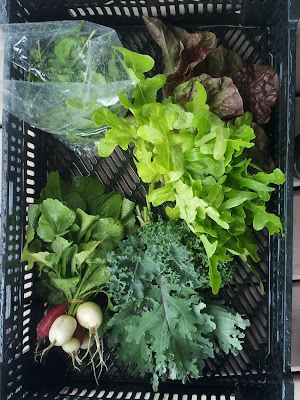 The CSA program allows us to share in the bounty of the harvest, and the disappointment of crop damage. This was driven home this week as deer decided to mow our Swiss Chard Crop. We had run electric wire around our whole garden plot, and now have added a line of fishing wire which supposedly frightens the deer when they bump into it, but cannot see it. The Swiss Chard has been reseeded, and as always with farming, we will keep trying and keep learning and adapting. On a similar note, I want to plug a new button on the right side of the page. This is the donate button, from PayPal. 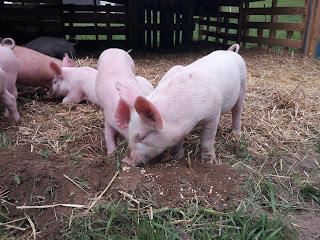 We will certainly continue to post all about the farm, and hopefully help educate about husbandry, farming, perserving, and cooking natural foods, regardless of any donations from the site. 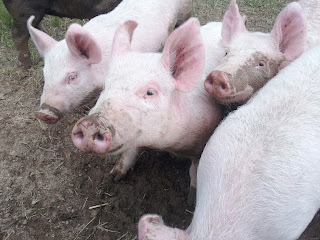 So if in addition to the support you show by visiting or purchasing from our farm, if you'd like to help more, please click the donate button. Or if you enjoy reading our blog and Facebook page, but are too far to buy from the farm but would like to support us, please click the donate button. We appreciate all the support and feedback from our readers and our shareholders, looking forward to a great season this year! So for you slow food lovers, this one is for you. 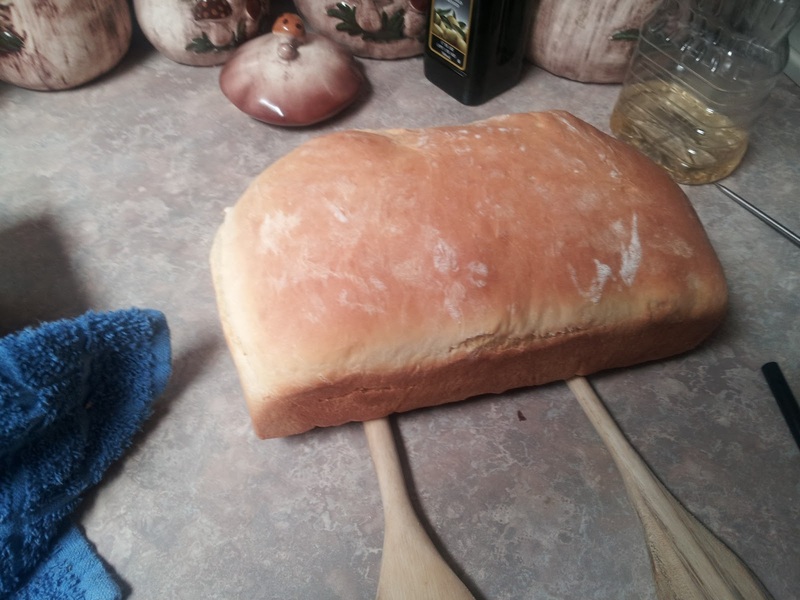 This bread is very yummy. It has a buttery taste and a great consistency for toast and jam, just like an english muffin. 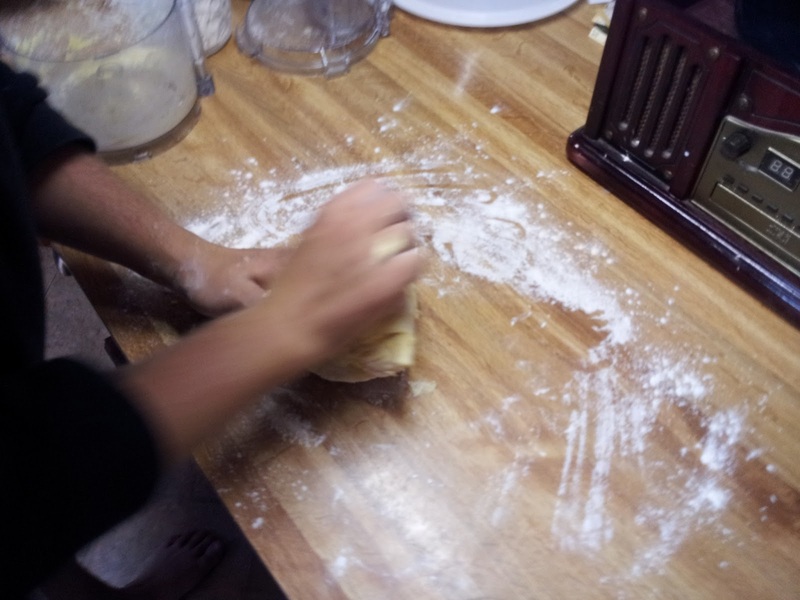 It takes some time to make though. So if you've made bread before you know there is some time invested for rising, but it is so easy other than the waiting and so good that you have to try at least once. SO one lazy saturday, mix this up while playing in the garden. 1. 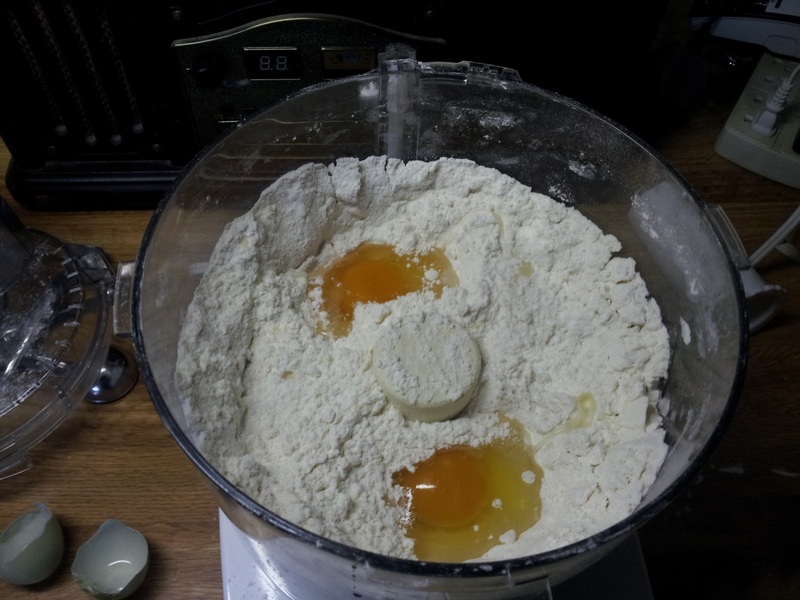 Begin by combining the flour, salt, sugar, and cold butter in a food processor. Pulse a few times to mix the butter without completely blending. Add yeast and eggs and pulse a few more times. 3. 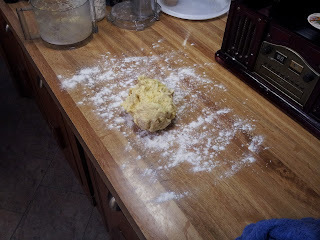 Once you have your dough ball turn it on to a floured work surface and knead it into a smoother ball. I highly recommend honey (leave out the sugar earlier if adding honey) or oats. 5. 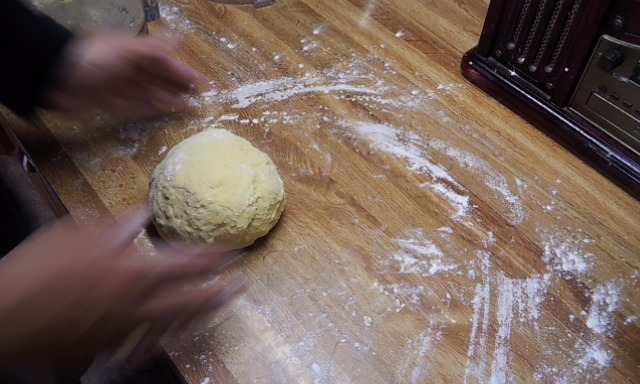 After dough has risen, it should nearly double in size. 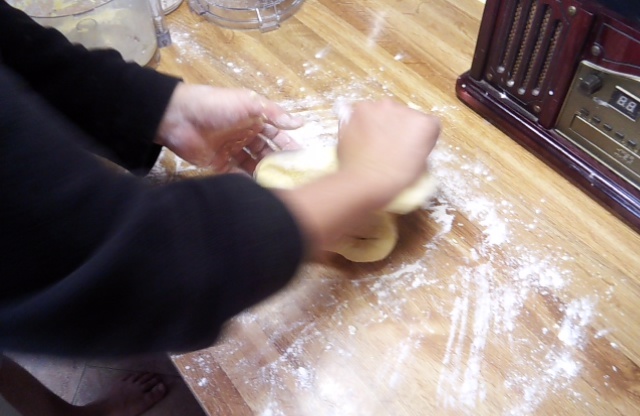 Remove it from bowl onto a floured surface, and rework into a ball as it will likely have flattened out as it grew. 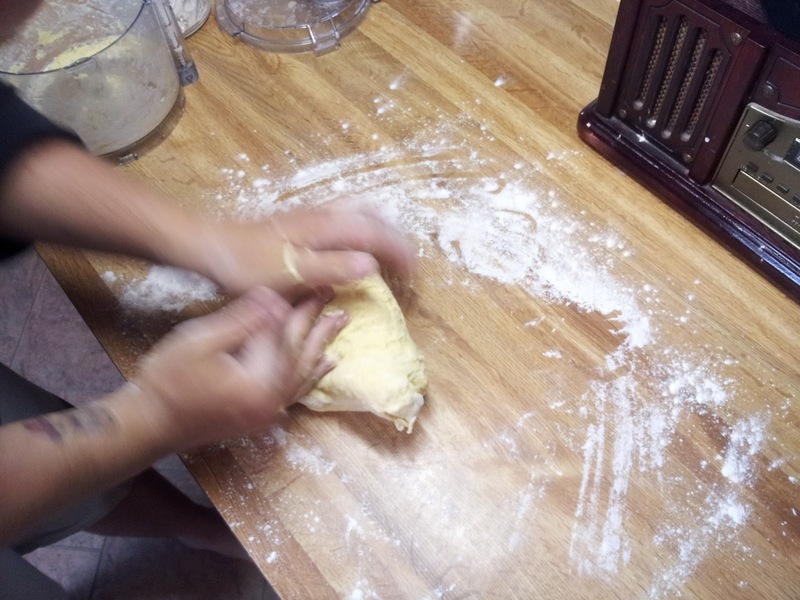 Let rest for 20 minutes with a towel over dough. 6. Now shape dough into your loaf. 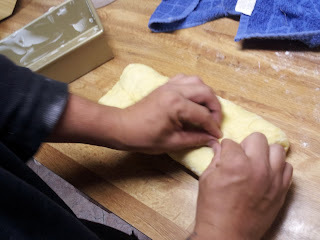 Start by gently stretching it into a rectangular shape the length of your bread pan, and about 2x as wide. Fold the long sides towards the middle so they meet, and pinch the seam together. 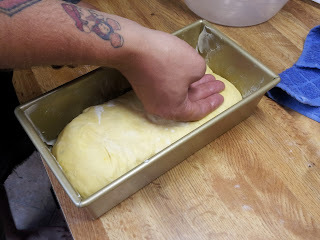 Place into a buttered loaf pan and gently smooth with back of hand. Let the dough rise in the pan another 90 minutes - 2 hours. 7. 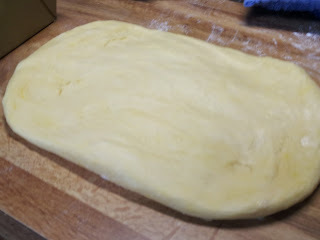 Almost finished, bake at 350 degrees for 45 minutes. 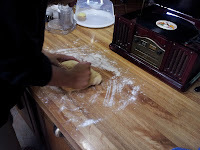 To check doneness, tap on bottom of loaf it should sound hollow. You can also use an instant read thermometer and it should read about 210 degrees if done.